A perfect alternative to hotels! Why choose a Lonneker Staete apartment? We regularly have guests who stay at Lonneker Staete for a longer period. We regularly offer good accommodations to people who work in the educational or corporate sector. A stay at Lonneker Staete is regarded as a sound alternative to hotels. The duration of the stay varies between one and six months. What is paramount is that our guests immediately feel at home at Lonneker Staete. During your stay it will be business as usual. Our modern switchboard makes it easy to make and receive calls. High-speed wireless internet is standard. Thanks to the extensive digital television content, which you can watch on the apartment’s large flatscreen, you will not miss any news and current events. Your car is parked safely in a closed parking space and there are numerous lockable areas where you can store materials or, for example, your golf equipment. 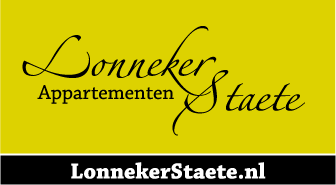 When you intend to stay at Lonneker Staete longer than 4 weeks, you can be assured of a discount of € 100,- on the week price. For periods longer than 4 weeks, we advise you to send us your reservation per e-mail by using the contact form on this website.